A pro racer needs pro pedals! Make your racing setup complete with the Thrustmaster T3PA-PRO pedals for the ultimate racing experience! The Thrustmaster T3PA-PRO 3-Pedal Add-On Pedal Set is a realistic, high-end pedal set that will take your driving experience to a whole new level! It offers 2 different positions (floor-mounted F1-style or suspended GT-style), 100% metal construction, 100% adjustability, and includes 2 different removable brake mods. 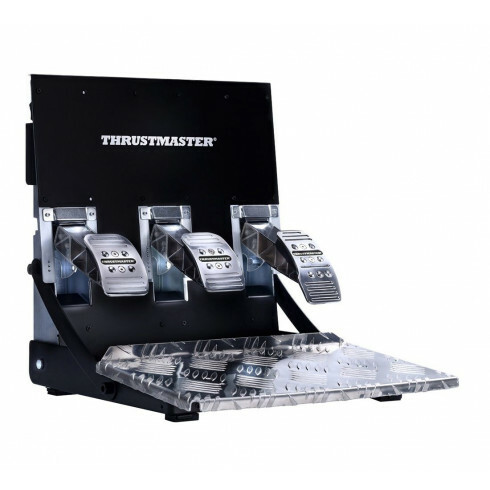 These pedals are compatible with all the Thrustmaster wheels from the T-series (T300, T500, TMX, T150 and TX) and Thrustmaster 458 Spider and can be used for PlayStation 3, PlayStation 4, Xbox One and PC. In order to adapt to users’ different needs and preferences, the T3PA-PRO is fully adjustable – including each of its 3 pedals: in terms of spacing (3 possible positions per pedal), angle of inclination (2 possible positions per pedal) and height (4 possible positions for the gas pedal / 3 possible positions for the brake and clutch pedals). This adjustability and versatility also includes the pedal set’s base, which features a unique design, allowing users to select between 2 different positions: floor-mounted position (F1-style), or suspended position (GT-style). The T3PA-PRO features 2 impressive compression springs: the resulting pressure force is adjustable according to the range of travel allocated to the springs. Users can therefore adjust to best suit their own preferences. This provides a big advantage in racing, since victory so often depends on the brake pedal’s performance. Thrustmaster’s latest pedal set doesn’t stop there: it also includes two removable mods, which can be installed directly underneath the brake pedal. With the first mod (the SPRING BRAKE MOD), composed of an additional compression spring, the pressure force can be adjusted between 30 and 35 pounds. With the second mod (the Conical Rubber Brake Mod), composed of a conical stop made from industrial-grade high-density rubber, the pressure force can be adjusted between 45 and 70 pounds. Using this mod, users will also enjoy an authentic feel thanks to an ultra-progressive resistance at the end of the pedal’s range of travel. The spacing and height of the 100% metal pedal set is also fully adjustable and accommodate individual driving preferences by offering 2 positions: "floor-mounted" F1 style, or "suspended" GT style. The brake pedal has been given extra attention, with reinforced and adjustable resistance that lets users perfectly tailor their braking with near surgical precision, and which includes a removable mod. A textured foot rest, also crafted entirely of metal, completes the pedal set. Gamers will notice that having 3 pedals at their disposal not only enhances the level of realism, but it also gives them a taste of what's to come with the addition of an independent gear stick, the TH8A. Enhance the level of realism of your setup by mounting Thrustmaster T3PA-PRO pedals on a Playseat® racing simulator!